This Irish jewelry box features a hinged lid along with wooden construction. 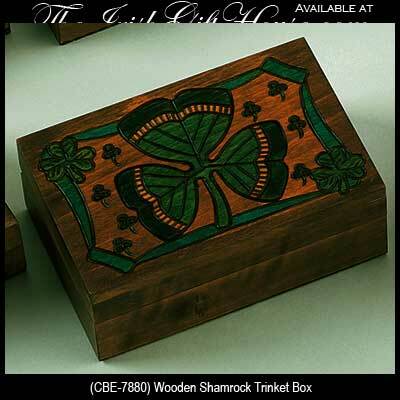 The wooden Irish jewelry box is enhanced with carved shamrocks and measures 6” x 4” x 2" tall; no two boxes are identical. This beautiful box is made of seasoned Linden wood from the Tatra Mountain region of Poland. The skilled artisans of this region employ centuries old traditions and meticulous handcraftsmanship to create a finished product of uncompromising quality. The use of feathered corner joints and raised interior lining ensure its enduring value as a lasting keepsake. These boxes are entirely decorated by hand, using various combinations of carving, burning and staining techniques. Once bestowed upon royal families throughout Europe as an elegant and exclusive gift, these boxes were used to hold timeless treasures. Then as now, each box is entirely handcrafted, is a unique masterpiece, and is exclusive in its detail and individual character. The Tatra Mountain lore adds a mystique to each box that combines with the premier craftsmanship to bring years of pleasure to the owner.